I run a few lunchbox groups and every year the same question gets asked: what’s the biggest lunchbox? 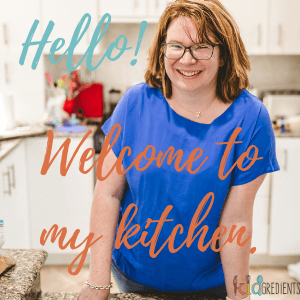 My kids are big eaters…they need bigger lunchboxes- what can I get them? And I’m thinking we need to change our thinking when it comes to lunchbox packing: think smarter not bigger. I’m going to explain what I mean and how you can do it too. My daughter is 7, incredibly tall and eats A LOT. 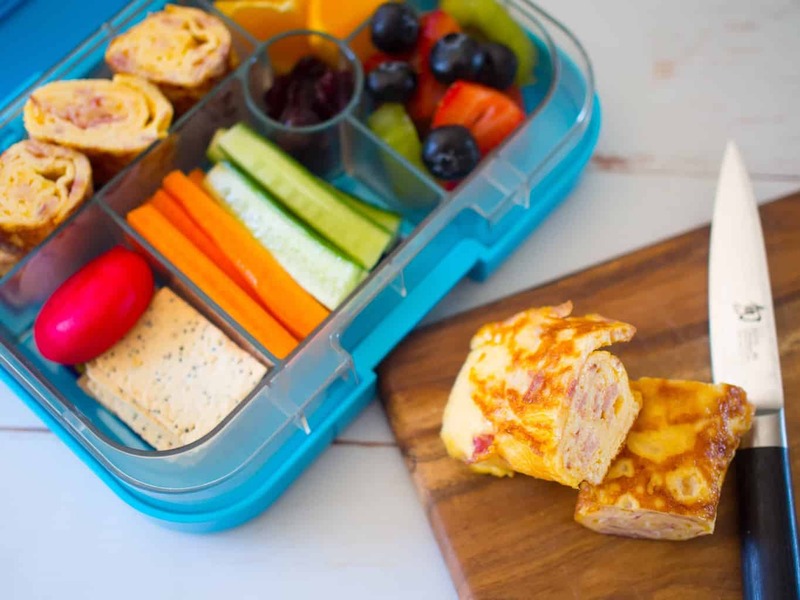 For a day at school she typically has: crunch and sip in a fuel dip n snack, recess from a Yumbox Mini Snack and lunch from a Yumbox Panino or Original depending on the day. She eats it all. She also takes water as her drink. Just because she eats it all, doesn’t mean she needs a bigger lunchbox, in fact the yumbox original and panino are designed for up to 8 years of age as a standalone lunchbox with the dietary requirements of our kids in mind. I think it will probably do my kids to at least age 11 as they also have recess and crunch and sip. If you’re packing a lunchbox which is devoured in seconds and doesn’t leave you kids full, then you need to rethink what you are packing, don’t blame the container and grab a bigger lunchbox. How can we overcome these issues of kids “needing” more food? Well, as a nation with a rising obesity rate and a health system that is struggling to cope with the pressures of this, we need to look at what we are packing. Take a look at your lunchbox packing: think smarter not bigger and see where it takes you! What can we pack that’s better for our kids and will help to sustain them longer? Aim for more protein- leftover chicken drumsticks, legumes, cheeses, boiled eggs, egg wraps, yoghurt, mini quiches, sushi with tuna or chicken, mini meatballs. Try not to pack white bread- use wholegrain breads and wraps as they help to sustain kids for longer. Don’t fall for the healthy gimmicks- so many foods are labelled as health foods, but are really full of sugar. Read labels and make sure you are actually packing healthy food. Pack veggies- either fresh and raw such as carrots, celery and cucumber or steamed like broccoli, corn cobs, leftover roast veggies etc. They take longer to eat than a sandwich and are better for them. Need more ideas? This collection will get you started with great recipes to help with Back to School. Or check out our lunchbox ebooks and printed books in our shop! If you really think you need a bigger lunchbox, check first what your kids eat on a daily basis at home in the holidays. Put it into a lunchbox and see if it fits. Remember as well that holiday eating doesn’t necessarily match with school eating as there is the distraction of play and friends at school and therefore eating lunch is often just a sideline event! 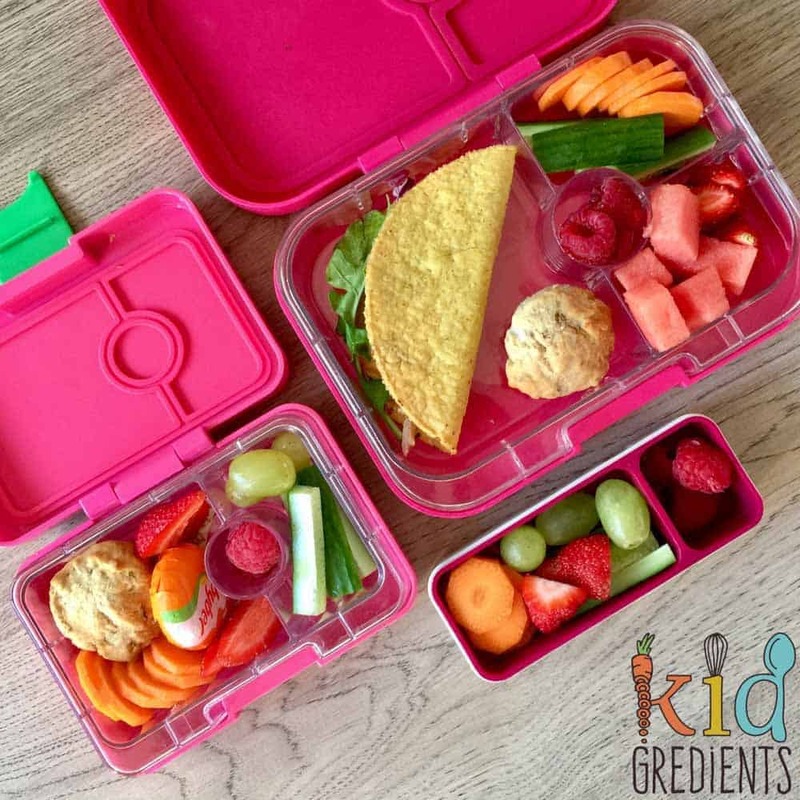 Don’t forget to check out the Kidgredients 2017 Lunchbox Review: for help choosing your lunchbox! Also, consider what your kids are having for breakfast. Try to pack lots of nutrients into the first meal of the day so that lunch doesn’t have to make up for the shortfall! 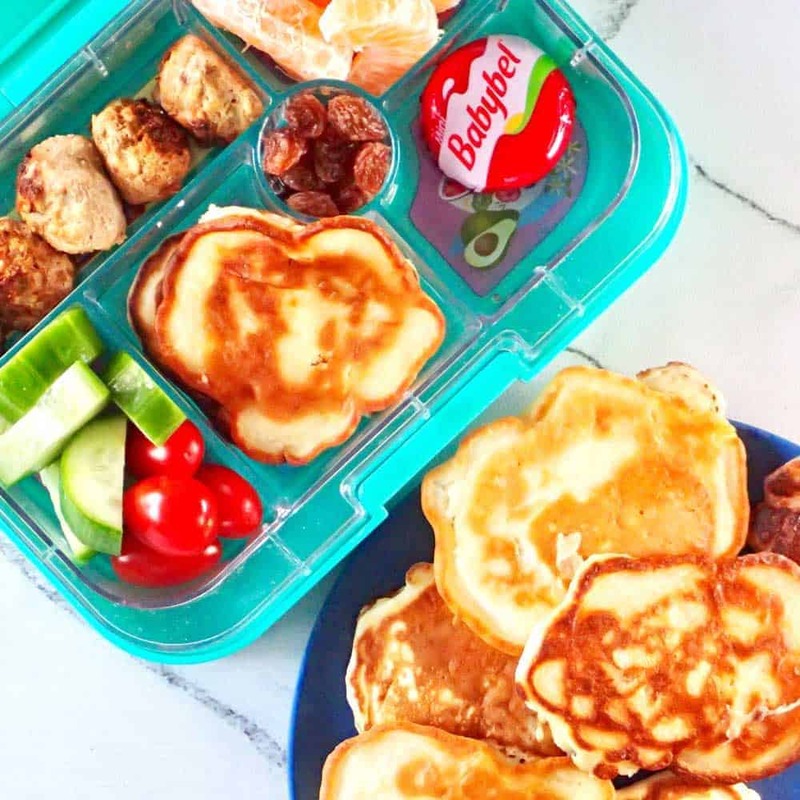 I find when my kids have had a filling and balanced breakfast they are much easier to get ready in the morning as they have the energy to get going! Some ideas for a filling and nutritious breakfast can be found here at Tasty Tummies. Or checkout some of our no sugar muffins such as these Apple oat muffins as a way to have grab and go breakfasts in the freezer for busy mornings! Previous Post: « Baked zucchini fritters, 4 ingredients! As a prep teacher and a mum of a 6ft + 14 yrold boy I fully endorse your comments. 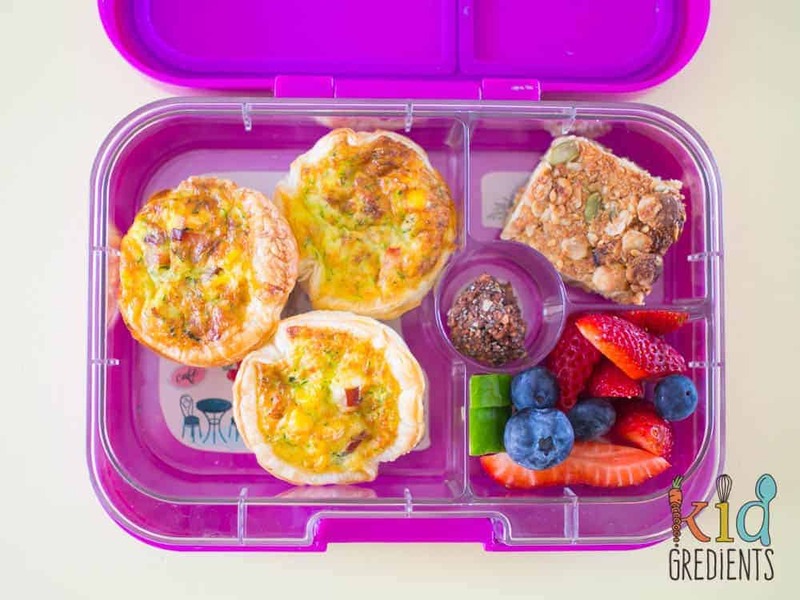 I have to say, for the most part, many parents are packing beautiful, nourishing lunchboxes. Great ideas, many of which I am packing. Fritters, flapjacks and layered taco dip with tortilla chips some more options I use.